American Kevin Bickner soared to a new U.S. ski jumping distance record on the HS225m hill in Vikersund, Norway on Sunday. The 20-year-old young man sat on an aluminum bar high above the Norwegian forest. He waited patiently for the sign from his coach, Bine Norčič. He was there to perform his craft in one of skiing’s oldest art forms – hurtling his body into the air and taking to wing. Growing up in the northwestern suburbs of Chicago, the fact that Kevin Bickner is a ski jumper is maybe a bit odd. But it speaks to the culture around the more than century old Norge Ski Club in Fox River Grove. Formed in 1905, long before alpine skiing took roots, the club was one of many in the midwest where Norwegian immigrants would hurtle themselves off wooden scaffolds into the crisp winter air. So popular was the sport that in the 1930s, the club erected a ski jump along Chicago’s lakeshore in Soldier Field. As a nine year old, young Kevin and his family joined neighbors to go out to the annual Norge winter jump. He made a beeline to the ‘Try Ski Jumping’ booth. That summer he was hooked, despite a crash on his very first jump. Bickner sat atop the towering HS225 meter ski jump in Vikersund, Norway with a sense of purpose. He’s become the figurehead of a renaissance of men’s ski jumping in America under a passionate new sports group, USA Nordic. Since a major renovation in 2010, Vikersundbakken has become the holy grail site for ski flying. Located along a lake shore an hour west of Oslo, the jump has been the site of ever-growing world distance records since the new jump debuted in 2011. Bickner’s first visit to Vikersund came 13 months earlier. It was a breakthrough as he soared 214.5 meters to finish 30th – his first World Cup points and just seven meters away from the American record held by one of his childhood heroes, Alan Alborn. It would establish a dream in for the young Chicagoland ski jumper. 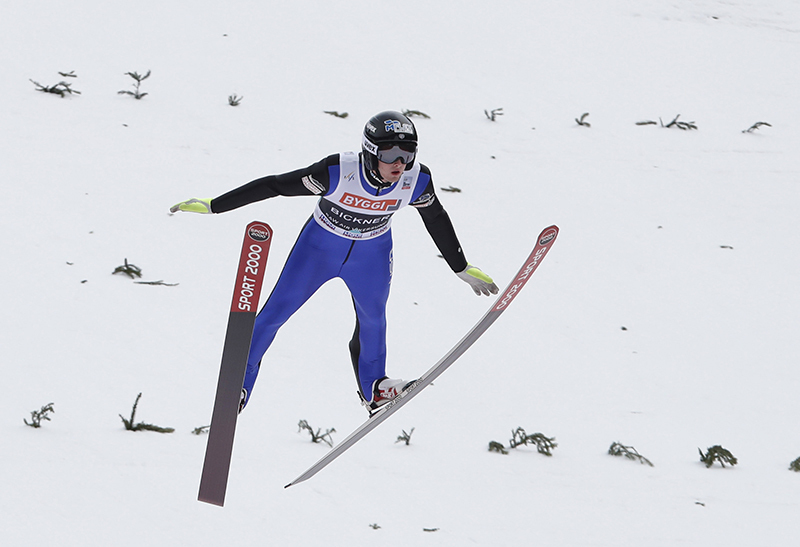 Ski jumping is a sport defined by the fine points – speed on takeoff, angulation of the body, position of the hands. A ski jumper travels around 30 meters per second. When you’re flying 120 meters off an Olympic-sized large hill jump, you’ll be in the air for around four seconds. But when you push it out to 240 meters on a ski flying hill, you soar silently through the air for nine seconds, pushing for every meter down the hill – small movements of hands and fingers steering their sleek bodies to eek out every last meter. To Kevin Bickner, this is what ski jumping was all about. 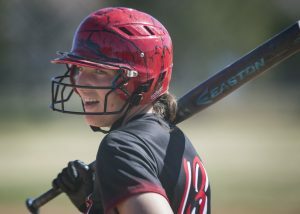 It had been a long season and it had been a while since he had set foot at home in Wauconda or his adopted home in Park City. He had spent much of his time basing in Kranj, Slovenia, traveling out to all corners of the globe including the Alpensia Nordic Centre in PyeongChang where he hopes to compete in his first Olympics next February. But all of it had been focused on making it back to Vikersund. In training he pushed it out to 215.5 meters – one meter longer than his competition jump a year ago. 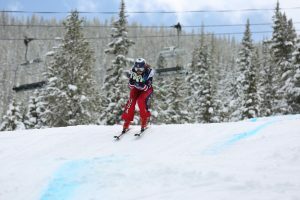 In Saturday’s team event, he went 202.0 meters but watched his friend and Norge Ski Club teammate, junior Casey Larson, stick it out to 216.5 meters – even further than Bickner had gone a year ago. But Sunday was his day. Riding the elevator to the top, his mind drifted back to the feeling he had a year ago – pushing to the limit on one of the biggest hills in the world. He thought about the thousands of hours of video he watched as a kid – jumpers floating through the air, smacking their skis onto the flattening landing hill and pumping their fists in exultation. That’s the feeling he wanted for himself on Vikersundbakken. Now it was his turn. Jumping 19th, he was chasing Norway’s Johann Andre Forfang from Tromsoe who went 242.5 meters. He was held for wind for nearly 30 seconds, then quickly got the green. He pushed off the bar and down the inrun. Six seconds to takeoff for nine seconds in the air. His skis swooshed down the inrun, launching himself at just the right instant, establishing himself in the air. The hill flashed below him. You fly low in Vikersund. He flashed past the hill size mark at 225m with good elevation so he knew he had a new PR. Then he just kept going. His hands worked the ever-changing wind. His head pierced the air and kept his body in an aerodynamic position further and further down the hill. It seemed like he would never land. But suddenly there was that smack of his skis. His body settled back as he struggled to use every muscle to get himself upright. He landed it! Kevin Bickner had just flown 244.5 meters (267 yards) – 23 meters past the U.S. record and even longer than the then-world record of 243.0 meters set during the debut of Vikersundbakken in 2011. It was a distance no other jumper would match that round, eventually putting him into 15th – the best American World Cup finish in 15 years. Kevin BIckner is young. But he knows his role. It wasn’t just about his personal best, it was about his sport. Man may not have been born to fly. But the daredevils of ski jumping have shown it can be done. For nine seconds last Sunday, Kevin Bickner flew like an eagle, floating majestically through the air, not a care in the world, finding a special peace through flight.